Southbound along the new Hillside Avenue bike boulevard, this segment connects across Highland Avenue to the first bike boulevard in the Town of Brighton. 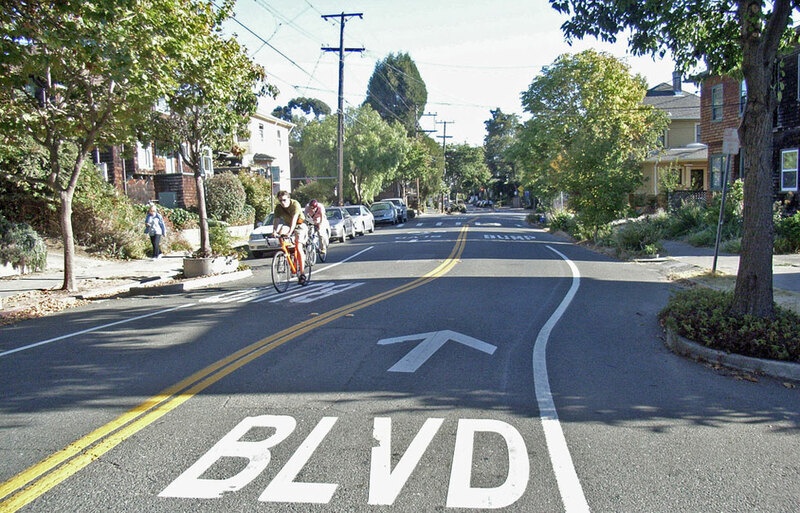 In late July the City began painting bicycle and chevron “sharrows” on Hillside Avenue. The week after Park Ave Summer Fest in August, the City began curb and fixture work in preparation for milling and resurfacing—starting from Harvard and Canterbury Streets, grinding westward to Monroe Avenue, then eastward to Culver Road, and ultimately to Colby Street—as part of a regular cycle of street repaving. A few other contiguous and even non-adjacent streets also got repaved, but for now only Canterbury and Harvard Street eastward become a bike boulevard. Though a few streets here have speed humps to discourage speeding and automobile cut-through traffic, none had before connected with each other to create a network of routes intended for people on bikes. Signs like this one remind drivers to share the road with cyclists. 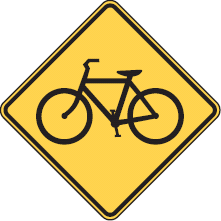 The combination of a bicycle symbol and left/right bi-directional arrows underneath signify bicycle crossing. Bicycle wayfinding signs will display the distances to common destinations and connecting streets as part of the bike boulevard network. Drivers should proceed slowly when driving along the boulevard, or even avoid it in favor of primary and other secondary roads. Applied onto the roadway, the bicycle and chevron sharrow designates a shared-lane for automobiles and bicycles. Expect cyclists to ride a line crossing the vertex of the chevron. 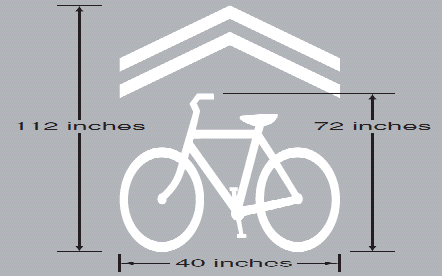 On bike boulevards, expect to see the sharrows placed in the center of the lane to avoid parked cars and opening car doors. Thus on the narrow segments of Harvard St, expect to see the sharrows very near the centerline of the street. 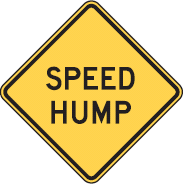 Speed Hump: the City plans to install a hybrid between speed humps and speed cushions. Because of the narrow width of Harvard St, the City chose not to use speed cushions, but instead center lower-profile, asphalt humps 3 feet from each curb, leaving track for cyclists to skirt the hump where no vehicles are parked. Drivers should slow down and thru-traffic should seek an alternate route. Cars are killing us, if not in crashes then via heart disease, hypertension, diabetes, and other diseases stemming from lack of exercise. Doctors now realize transportation and land-use planners could save (or take) more lives by how they design our streets, than medical professions. Healthcare now accounts for over 17% of our economy, spending which mostly treats diseases rather than elevates our standard of living. Those charged with improving our public health have thus prescribed walking, cycling, and other modes of active transportation. Cities across the world—from Portland to Copenhagen—have found over the past 40 years, building protected bikeways, cycle tracks, and designated bike routes contribute to dramatic uptake for cycling, especially as transportation. Plans in Rochester took root in January 2011 when the City published its first Bicycle Master Plan, at the behest of the Rochester Cycling Alliance and other advocates. The plan was a product of a year’s work by Erik Frisch, the City’s first Transportation Specialist to emphasize bicycle planning. Comprehensive in scope, the Bicycle Master Plan identified major elements people need before larger numbers begin to use bicycling as transportation. That meant incorporating not just infrastructure, but also education and enforcement. Later that year the first major project implementing parts of the Master Plan, the Bicycle Enhancement Program, began painting 15 miles of the first much-needed bike lanes in Rochester onto arterial and collector streets not then due for resurfacing (such as South and Dewey Avenues). Though the Program laid bike lanes onto busy avenues, the network of connectivity between the bike lanes, trails, protected bikeways, and bike boulevards had yet to emerge for low-stress cycling. The next major element in the Master Plan, planning for a bike boulevard network, was completed last year. 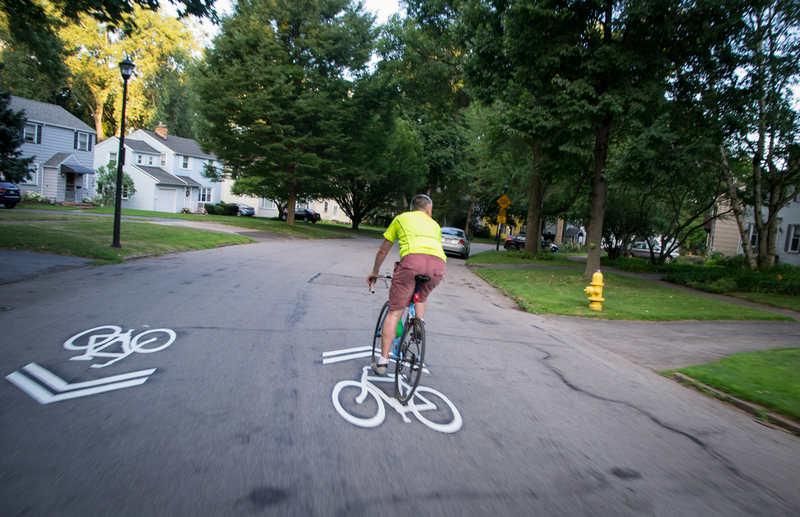 The City installed test bike boulevards, one along Frost, Rugby, and Woodbine Streets on the west side; the other, along Averill Ave, Pearl and Meigs Streets on the east side. To consolidate work and minimize costs, the City folded the first bike-boulevard project and installation of speed humps and signs as part of the planned cycle of street milling and repaving, sidewalk repair, curb work, and drainage improvements. The work along Harvard Street has already begun. The City bonded $2.2 million of the $2.6 million project, according to a Democrat & Chronicle article, but the bike boulevard incurs only a fraction of overall construction costs. A big reason the City chose to start the first bike boulevard from Hillside Ave was due to the Town of Brighton’s bike boulevard plans. 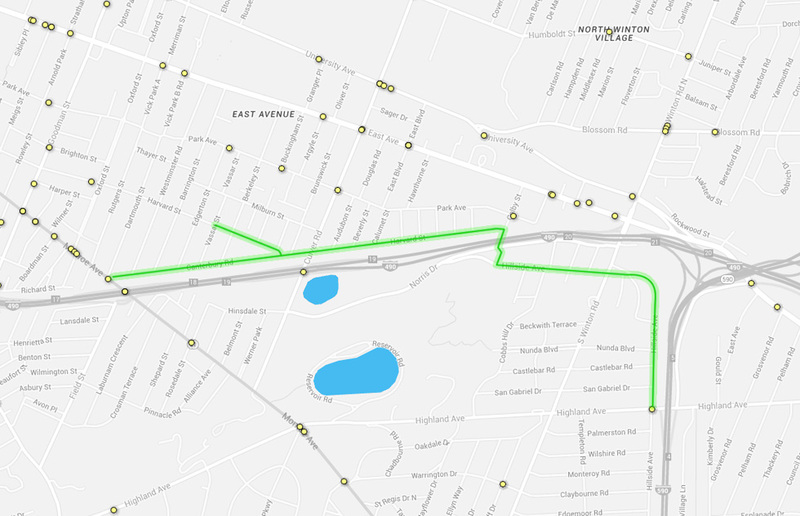 Brighton’s first bike boulevard will be on its segment of Hillside Ave, from Highland Ave southward to Claybourn Rd, then across Winton Rd, through Warrington Dr, across Monroe Ave to Sylvan Rd—connecting to the Brighton Town Hall and Memorial Library complex. According to Brighton Town Engineer Mike Guyon, installation of signs marking the bike boulevard starts this fall pending availability of crews. Painting the sharrows should occur next spring. When both boulevards are completed—or even now for those who know the route—cyclists can avoid riding on Monroe Ave and reach not only Brighton Memorial Library, but also Twelve Corners, by continuing along Hillside Ave to Chelmsford Rd. 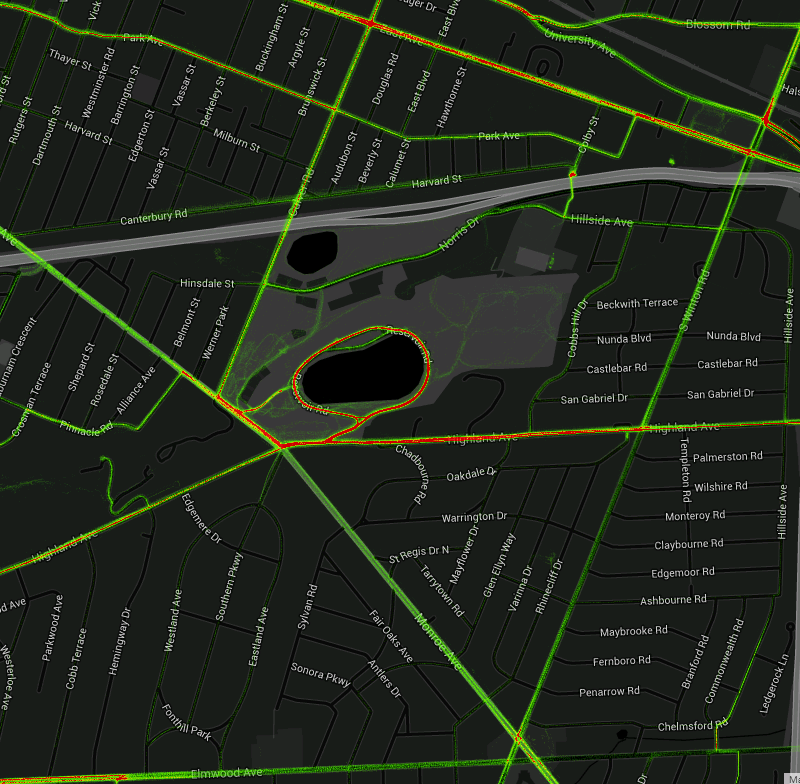 This inset above from the Reconnect Rochester Crashmap shows, over the five-year interval from 2010 through 2014, only two car-bike crashes with injuries, one at each end of the bike boulevard, at Monroe Ave and Canterbury Rd, and at Highland Ave and Hillside Ave. Though the City boulevard itself sees comparably less car traffic, its intersections with the major avenues see much more. The segment of the bike boulevard within Brighton over the same five-year period saw two additional car-bike crashes, one again at Monroe Ave, and Sylvan Dr, and the other along Warrington Dr at Rhinecliff Dr, both residential streets. Compared to surrounding streets and especially primary roads, the streets chosen for the bike boulevard look safe, but the streets in Brighton also see very little bike traffic. The heatmap above shows where cyclists using Strava have ridden recently. Note most cyclists have yet to incorporate the bike boulevard into their routes and instead follow major avenues and primary roads, navigating as would drivers. Follow Reconnect Rochester on Facebook and Twitter for an update next season to see how cyclists using Strava use the bike boulevard in relation to the surrounding streets. We should be excited. Not only do cyclists perceive designated bike routes as safer compared to other route types, they actually are. As more cyclists understand a given route as safer, they begin to use the route. And as drivers notice them, actual safety grows. The phenomena, Safety in Numbers, becomes a virtuous cycle.